Maybe it has to do with the sport’s ties to the British Isles, but I’ve always thought golf was closest to its essence in nasty weather. Clear skies are best for the players, sure, but there’s something romantic and even nostalgic about seeing them wind- and rain-battered, hitting low shots as they squint into the overcast horizon, overpowered by the elements. That’s why I was excited that this year’s U.S. Open took place at The Olympic Club in San Francisco, and why the first three sunny days left me a bit empty. We were promised fog! It finally crept in Sunday, and the dark skies and heavy air set the stage for an ugly final round, where Raleigh’s Webb Simpson stole a major title from seasoned contenders such as Jim Furyk and Graeme McDowell. Don’t get me wrong — Simpson earned every bit of his championship. He closed with a stellar 68-68, going four under par on a weekend when nobody else in the top nine could even reach -1. His chip on 18, from a ridiculously unlucky lie that may or may not have been the ancient home of a buried sprinkler head, was about as clutch as clutch comes. But it was a strange win. Golf is unique in the sense that a winner can, theoretically, emerge from any group on the course. The eventual champ can finish hours ahead of the final pairing and watch as they fail to match his total. Simpson, in the fourth-to-last group, saved his par on 18 more than an hour before the snail-like Furyk and the charging McDowell made things official, and was reduced to watching from the clubhouse. Unlike every other sport I can think of, when someone from the winning side has to be on the field of play at the final moment, a deferred triumph is possible in golf. In practice, though, it’s rare. There’s no better example of the primacy of final pairings than the greatest golfer of our generation, Tiger Woods, who has never won a major when trailing at the start of the final round. Think about that — one of the top two or three American sporting icons has never managed a comeback win at a major. Conversely, he had never lost a major when leading or sharing the final-round lead until Y.E. Yang clipped him at the PGA in 2009; he’s 14-1 overall. Despite the open possibilities, major golf tends to belong to the leaders on Sunday. In the past five years, starting with the 2008 Masters, the champion has come from outside the final two pairings just three times. Martin Kaymer needed a playoff to win the 2010 PGA championship from the third-to-last pairing, and Stewart Cink broke hearts around the world by beating Ol’ Tom Watson in a British Open playoff in ’09 after starting in the fourth-to-last group. Simpson is the only man over the last 18 major tournaments to win outright from such a deep position, and that win comes with a few unflattering secondary story lines. As onetime U.S. Open winner Johnny Miller was eager to tell us from his infallible perch, Jim Furyk suffered a Norman-esque meltdown on the final three holes. It started on 16, with one of the worst duck-hooked drives you’ll ever see from a professional golfer. Until that point, he had played his usual brand of cautious golf, a style destined for failure at scoring courses like Augusta, but perfectly suited to the miserable conditions at Olympic. He began the day in the lead at -1, and had made some excellent par saves over the first 15 holes to stay in contention at +1, tied with Simpson. With two par 5s ahead of him, and no. 17 a relatively easy birdie hole, he was well positioned to win his second major. Then the drive on 16 careered into the woods, a cautious 17th yielded a killer par, and a poor wedge approach on 18 had him holding the club in his teeth, grimacing in the midst of his collapse. 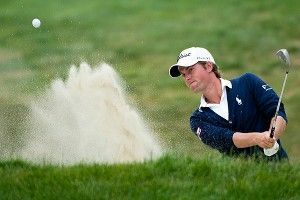 When a final desperation shot went from bunker to bunker, it was clear he wasn’t adding a second major title to his résumé. Which was a shame, because his Average Joe demeanor and his lurching swing — “Like an octopus falling out of a tree,” according to David Feherty — make him seem, to quote Grantland editor Sean Fennessey, so damn ordinary. And likable. And vulnerable. Watching him lose wasn’t quite as devastating as Watson’s attempt to reverse time in Scotland, but it was close. Still, that vulnerability, etched on his sharp face from the start, made it less surprising when the wheels came off. Not so for Graeme McDowell, a guy who looks like he’ll bite your head off if you dare challenge him under pressure. Make no mistake — it was a bad round for McDowell. He was -1 just like Furyk at the start of the day, and he went on to hit just three fairways all round. The very Irish weather wasn’t helping out the Portrush native, but when he sank a birdie putt on 17 and hit a fantastic approach from the rough on 18 to give himself a chance to tie Simpson, you finally saw the man who survived the Pebble Beach massacre to win the 2010 U.S. Open and won the final match in the 2010 Ryder Cup to give Europe a one-point win over the Americans. When the stakes are raised, his eyes turn dark and he walks with a forward lean, like he’s hell-bent on winning a fistfight with a man who insulted his wife. You very much don’t want to screw with McDowell at those moments, and as he stared down the 24-foot birdie putt on 18, you got the sense that he’d beat the innocent-looking Simpson by about 10 strokes in a Monday playoff if he could just sink it. Then, unthinkably, a butchering. The putt had a right-to-left break, but McDowell started it left all the way, and looked genuinely puzzled as it rolled harmlessly past. In the clubhouse, Webb smiled and blushed, and his wife asked him if she could scream. He nodded, and she did. Did you hear the guy who yelled after every Furyk drive, shouting non sequiturs like “Ba-Ba Booey!” and “Yabba-Dabba-Doo!” It had to have been this same man, right? The squawking British fan with the Union Jack hat who interrupted Simpson’s interview with Bob Costas? The champ handled it with aplomb, saying, “Enjoy the jail cell, pal,” but what kind of omen is it that a British fan crashed the party at a U.S. Open? interesting, to put it mildly, and it’s easy to see the avian antics at Olympic as the opening salvo for the showdown in Medinah.